Small size, stainless steel case, silver sunray dial, quartz movement. Includes interchangeable stainless steel bracelet, extra strap, and a stainless steel deployant buckle. Water resistant to 100 meters (330 feet). Small size, 18K yellow gold case, silver sunray dial, quartz movement. Includes interchangeable 18K yellow gold bracelet, extra strap, and an 18K yellow gold deployant buckle. Water resistant to 100 meters (330 feet). Small size, stainless steel and 18K yellow gold case, silver sunray dial, quartz movement. Includes interchangeable stainless steel and 18K yellow gold bracelet, extra strap, and a stainless steel deployant buckle. Water resistant to 100 meters (330 feet). Small size, 18K yellow gold case, bezel and crown set with diamonds, silver sunray dial, quartz movement. Includes interchangeable 18K yellow gold bracelet, extra strap, and an 18K yellow gold deployant buckle. Water resistant to 100 meters (330 feet). Small size, 18K white gold case, bezel and crown set with diamonds, silver sunray dial, quartz movement. 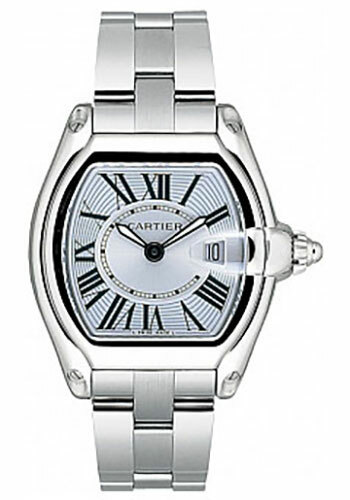 Includes interchangeable strap and an 18K white gold deployant buckle. Water resistant to 100 meters (330 feet). Small size, 18K white gold case, bezel and crown set with diamonds, silver sunray dial, quartz movement. Includes interchangeable 18K white gold bracelet, extra strap, and an 18K white gold deployant buckle. Water resistant to 100 meters (330 feet).